Original Mini Top Clip Backpack - Rubberized Leather is rated 4.0 out of 5 by 2. 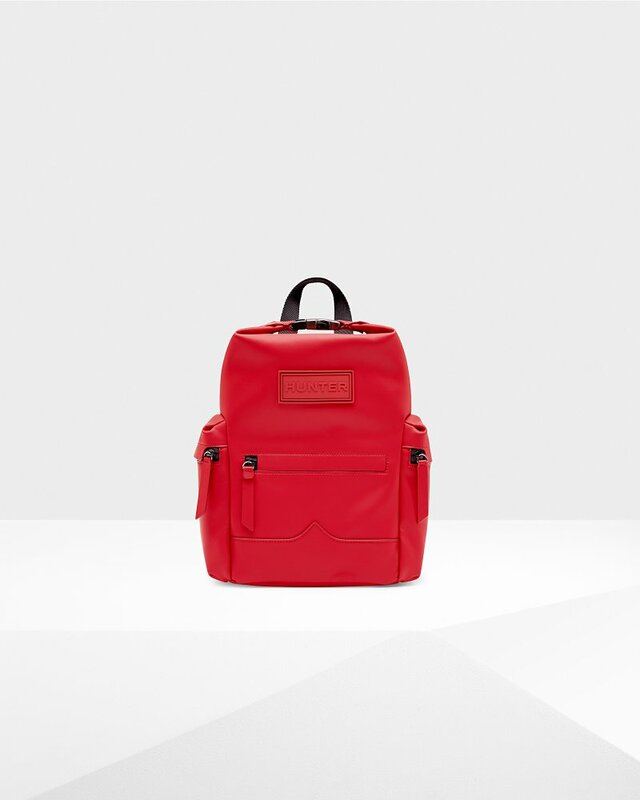 A practical, weatherproof backpack crafted from water-resistant rubberized leather finished in bold red. The neat and compact body of the bag fits an 11" tablet and is secured with a parachute clip and zip at the top, while the moustache detail at the front references our iconic Original Tall Rain Boot. A 7.5cm depth and 6L capacity ensures there is plenty of room for everyday essentials. Rated 4 out of 5 by horsegirl99 from Nice bag. I do like this little bag although I find the material isn't as nice as I was hoping. It's far more of a rubber than I'd expected and it seems to mark very easily. The size is fine as I just use it as a purse, being able to carry it on my back makes things simple when my hands are full. Having the top clips done up seriously changes how much you can put in it. I do wish the back straps could tie down and out of the way when I don't want to have it on my back. They just hang and it seems a little unrefined. Overall a nice bag and I do receive complements on it when using it, especially from people familiar with the Hunter brand. Most including myself don't believe it's worth the money but I'm ok with paying for the brand standard of quality and workmanship. It's perfect for the spring weather.